bit of a mystery as to how that is determined. This article presents details of the process of deciding the winner of the annual award, an elaboration of how the “best” criteria are applied, a brief history of the award and some recent changes in the eligibility requirements for the award. Other than annual announcements of the winner, the last discussion of the subject award appeared in this journal for February, 1968, in a short article by George W. Brett.1 Brett, for those of you new to the USSS, was one of the greatest philatelic researchers, an authority on stamp production, a prolific author with more than 500 articles to his credit and, among his many awards, the first three-time winner of the Hopkinson Literature Award. His contributions to philatelic research were recently honored in conjunction with our last Annual Meeting. Figure 1. 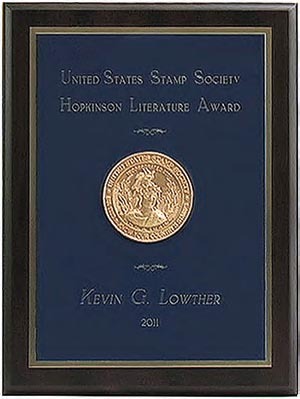 The Hopkinson Award Plaque for the 2011 winner, Kevin G. Lowther. consists of an engraved plaque with the Society’s seal [Figure 1], and an honorarium. spirit in which the award was established. The traditions that have built up over the years in coming to decide the annual award winner and my personal comment on the details of the award criteria follow. during the year of details of the process to prepare for the role as a selection committee member. Barring unusual circumstances, the earliest winner is asked to serve as the chairman of the committee. The chairman leads the committee in coming to an award selection. The committee is usually asked to reach a decision so that a notice about the award can be published in the March or April issue of The Specialist. That places the target for a selection by mid-February. Earlier decisions are always welcomed. selection committee members and sent to the President for a final review and submission to The Specialist Editor for publication. The President may also prepare or have prepared a publicity release for other publications. The award, if decided in time, is presented at the USSS Annual Meeting, which is often held in May. The winner receives the plaque and an honorarium in person if able to attend. If the winner is unable to attend, often a “thank you” statement is sent for reading at the meeting and the plaque and honorarium are delivered by mail. One more tradition: many winners have donated the honorarium accompanying the award back to the general funds of the Society. I personally have deviated from this tradition, once rewarding my wife for her extreme tolerance of my writing activities and the effect it had on “family time” and on another occasion to fund research in progress that I otherwise would not have been able to support. Following this tradition is of course at the discretion of the winner. published in previous years are considered with the parts published in the award year. Generally, the majority of the article should be published in the award year, but that is not a hard-and-fast rule and exceptions have occurred. All the work of an author printed in the award year may be considered as a “series of articles” and are as a group to be eligible for the award. For example, in 1984, I won the award for various unrelated articles on Washington-Franklin head issues. Selection committee members may have been involved in the preparation or review of articles they judge. If they are not named as authors, there is no restriction on their selecting that article, and they must include all articles in their deliberations. The winner is the author or authors of that article or series of articles judged as “best.” More than one member may win the award in a year, as occurred for the first time in 2009 when Gerald Nylander and I received the award for an article we co-authored. There is no specified decision path for the committee and, in my opinion, there does not need to be any codified path nor strict criteria. The selection committee chairman sets the path to a decision, and a wide variety of systems have been used, all producing appropriate results. I have served on committees that listed all contenders and voted for each with a “1 to 10” rating system, giving the award to the article scoring highest in the combined total.Another past process had each committee member picking three authors, in order of first through third choice. First choice author receives 3 points, second choice gets 2, and third choice, 1 point. The author with the highest number of points receives the award; discussion is needed if there is no clear single winner. quickly. Before the internet, correspondence was by mail and the decision was often less timely. (1) Original research – development of new facts from examining data, not just finding information from previous literature. The new information should add in a substantial way to knowledge of the subject. (2) A meaningful subject to U.S. specialists. (3) A clear, comprehensive presentation – the information needs to be presented in an easily understood writing style with thoroughness. Illustrations should be relevant and of good quality. (4) Comprehensive identification of past literature and proper citations so that future researchers will have a knowledge of what was known to the author. While original research is most important, the others factors need to be considered as well. Note that the length of the article is not in itself a factor and the award can go to a single article just as well as a long series. Often lengthier presentations contain more research results and are more comprehensive, so they do in general fare better in the judging. The “best” article will generally be interesting reading, and be neither too short to treat the subject adequately nor be excessively lengthy due to filler material. Walter W. Hopkinson was a member of the Philatelic Plate Number Association, the predecessor to the BIA. He formed one of the most extensive plate number collections and used it to share information with numerous other collectors, assembling data on plate numbers and studying plate varieties. He is credited with discovering “Blue Moon” and “Red Sun” varieties on the bicolored Beacon Air Mail issue of 1928, Scott C11. As a retired engineer, he traveled widely and was personally well known among collectors. He passed away at age 71 in 1953.2,3 His wife, Constance Braine Hopkinson, established the literature award in his honor and the first award was made in 1954 for articles published by a member in the 1953 issues of The Specialist. The award at the time was an honorarium of $100, an amount now increased to $500. been continuously awarded since its inception. This is unlike the Walter W. Hopkinson Trophy, which has not been awarded during many years. Since its establishment, the award has been presented to 47 individuals who have had their work honored, with nine of these being multiple winners and just four persons receiving the award three times or more. The award serves the USSS well by continuing to encourage the presentation of quality articles in The Specialist, honoring those members who achieve that goal and preserving the memory of Walter W. Hopkinson. At times it has been suggested that the award process and criteria be codified to provide future Selection Committee members firm guidance and perhaps achieve greater uniformity of awards. The 59-year history of the award has provided adequate examples of how to accomplish the selection. inadequately documented, unevenly applied over the years, and contain unnecessary restrictions such as the ineligibility of the Executive Secretary and the Treasurer. With the intention of better defining the eligibility criteria and eliminating unnecessary restrictions, the current USSS Board recently unanimously approved the following criteria for the Hopkinson Literature. winner(s) will fill the position. or series of articles was published in The Specialist. Specialist when the article was published. (4) The members of the Selection Committee are not eligible. (5) The article must have been published during the year being considered. of the Selection Committee shall be resolved by the President. by the Selection Committee using whatever process they deem appropriate. Specialist, Vol. 39, No. 2 (February, 1968), pp. 68-69. Specialist, Vol. 24, No. 9 (September, 1953), p. 197. No. 9 (September, 1953), p. 198.